This paper is about funding to keep older signalling systems on the Central, Picc and Bakerloo lines functioning until more major upgrades take place. Not read it in detail. Before they decide to keep the old legacy stuff they want to make sure they have enough parts we struggle as it is let alone years down the line when it gets harder to get equipment. 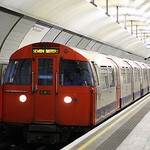 It is interesting that the Central line, the most modern of the old legacy signalling, is the one that has the highest estimated final cost, £5 million more than the Piccadilly line, whose technology dates back to the 1960s.